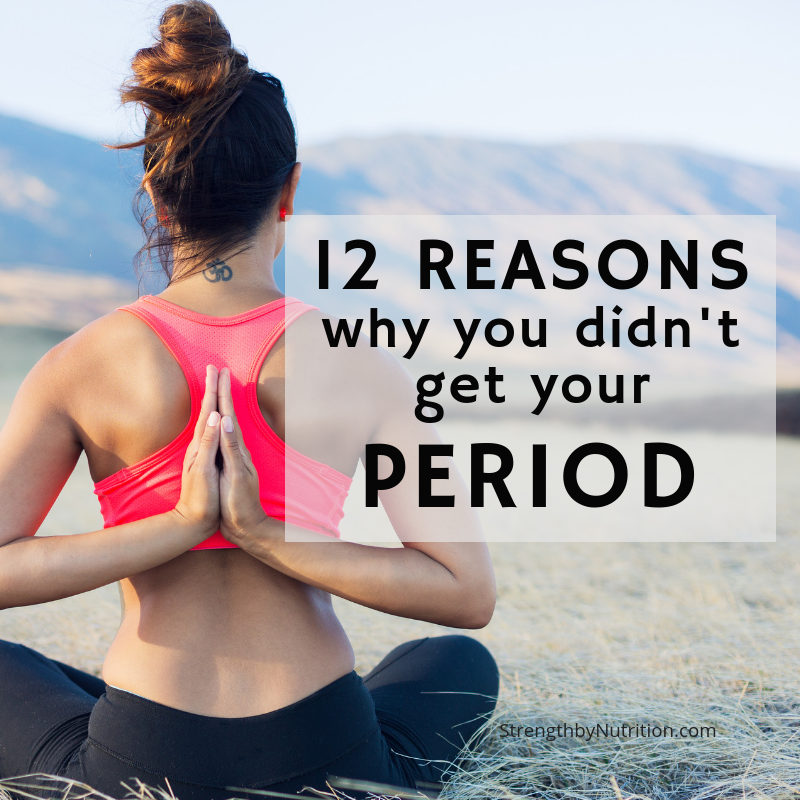 Beside the obvious of being pregnant, what other reasons could our period be late? Missed or late period happen for many reasons. Common causes can range from serious hormonal imbalances and disease to as little as having a stressful season at work. Remember that our period is generally going to be ‘irregular’ during our pubescent years as well as peri-menopause, so aside from those two phases in our life, we should be getting a period regularly. Stress – starting out with a big one here. Many women are so encompassed with living a go-go-go life that they don’t even know who they are without their 10 billion commitments. Long story short, we all need to spend more time in the rest and digest mode versus fight or flight mode. Being more zen and chill will keep cortisol down and our hormonal systems working properly. You’ll want to check to make sure you aren’t over exercising. Exercise modalities such as CrossFit, Spin, Running, and HIIT classes put a lot of emphasis on intensity and volume and may be too much for you to recover form on top of your hectic life – even more so if you are competitive, ladies. Click here for ways to chill TFO). Illness – similar to stress, when our brain senses an environment that is not suitable to bring a healthy baby into, then it’s going to conserve energy by ‘shutting down’ the reproductive system (which has a large energy requirement) so we can’t get pregnant (an even greater energy demand). Recently I had the flu right before I was supposed to ovulate and ended up getting my period 10 days later than normal. Low Body Fat % – women with exercise addictions and disordered eating appear to struggle with this the most. The official term is hypothalmic amenorrhea and occurs when your hypothalamus sense a lack of incoming energy and ‘shuts down’ your reproductive system to conserve energy. Best way to combat this is to begin eating more healthy protein, carbs and fats until you reach your caloric maintenance (to find out how much you should be eating, click here). High Body Fat % – just as low body fat percentage can cause hormonal changes, so can having too much body fat. If you need help losing weight in a healthy and sustainable manner, please contact us for help. PCOS – polycystic ovarian syndrome affects a large amount of women and responsibly for the majority of infertility. PCOS is a metabolic disease where insulin resistance causes the ovaries to malfunction and product androgen instead of estrogen. Recent Birth / Breastfeeding – Once we give birth, it is up to us and our baby if we’d like to breast feed. If you do, your body will produce the hormone called prolactin to keep you lactating and feeding the baby. Prolactin also inhibits ovulation so you won’t be getting your period anytime soon unless you start weaning your baby off. Birth Control – if you are on an oral contraceptive birth control, you aren’t ovulating and you aren’t actually getting your period when you take those 4 sugar pills at the end of the pack (read more here). If you have an IUD, or other progestin-only form of hormonal IUD, then you are likely ovulating, but not bleeding each month. How? Because the progestins put a damper on the effects of estrogen so you don’t get the normal building of the uterine lining each month. No lining, no bleeding. For information on how to ditch hormonal birth control with doctor’s consent, click here). Low Progesterone – progesterone is a hormone produced by the ovaries as a result of releasing an egg (ovulating). So if you didn’t ovulate, then you aren’t going to get your period (some exceptions here like estrogen threshold bleeds, etc). Symptoms of low progesterone include PMS, anxiety, sleep disturbances (especially during the late luteal phase), shortened luteal phase (10 days or less) If you think you have low progesterone, click here. Chronic Disease – chronic diseases like diabetes and celiac disease can alter your cycle. Changes in blood sugar, hyper-permeable gut, and chronically high insulin all cause an immense amount of inflammation in the body. Chronic inflammation then stokes a chronic stress response (back to number 1). Diet and lifestyle change can be a major contributor to how severe your symptoms and progression are of these diseases. Consult with a doctor first before starting any new plan. Thryoid Disease – an over and under active thyroid could cause late periods. The thyroid regulates metabolism so overall hormone levels are affected. Symptoms of a a sluggish thyroid include slow digestion, cold extremities, fatigue, fat gain, hair loss, and dry skin to name a few. To find out if your thyroid needs some love, consider these blood tests at your next doctor’s appointment. Premature Ovarian Failure – defined as a loss of normal function of your ovaries before the age of 40. If your ovaries ‘fail’, you aren’t producing enough amounts of estrogen to release an egg. Symptoms include that of which you experience from low estrogen during peri-menopause such as hot flashes, night sweats, vaginal dryness, and decreased libido. Conventional doctors claim that there is nothing you can do to bring back the function of your ovaries, but we think differently. (within reason) Lifestyle and nutritional changes along with a few select supplements have been show to restore the function of older women’s ovaries. We are all for you learning about and problem solving your own body, but if at any time you feel the need to go to a doctor, please do so. For all other questions and comments let us know in the comments.